Vibrational spectroscopy includes infrared, near-infrared and Raman spectroscopies that vary in their applicability. Raman spectroscopy provides highly specific chemical fingerprints of samples. It can be employed for a wide range of applications in the fields of life and materials sciences; e.g. research of pharmaceuticals, living cells, complex biofluids and cell organelles as well as commercial applications in geosciences and mining industry. However, Raman spectroscopy has suffered from fluorescence backgrounds swamping the Raman signals. Investigation of samples that have previously been beyond the reach of traditional Raman is now possible. Timegate Instruments has developed a compact and cost-effective patented Raman technique, PicoRaman, which enables acquiring fluorescence-suppressed Raman spectra. Time-resolved Raman spectroscopy provides accurate analysis for many applications. Timegate Instruments' new and patented Raman spectroscopy technology with pulsed excitation and gated detection rejects fluorescence of sample material, resulting in more precise analysis results. The technology can also be used for research of reactions carried out at high temperatures even above 1500°C degrees, which has often been challenging for spectroscopic analyses. 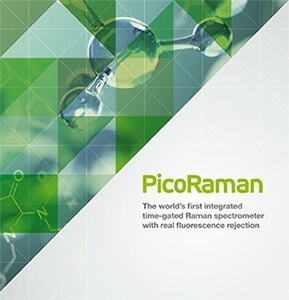 Simultaneously PicoRaman instrument provides an effective method for fluorescence rejection without losing intensity of the Raman scattering. Download a brochure regarding Raman technology in catalysis research in here! Raman spectroscopy is a feasible tool in forensic science. It can be used to investigate fibers, explosives, drugs, paints, inorganic fillers, counterfeit notes and other materials. Typically these materials give rise to high fluorescence, which can be effectively rejected with time-gated Raman. The new Raman technology allows for accurate analysis with little or no sample preparation. The PicoRaman instrument is also capable of measuring through glass and plastic materials, and the measurements produce clean and narrow spectrum bands. Raman spectroscopy can be utilized in research and development of semiconductors. As even minor imperfections in semiconducting materials have an effect to their usability for technical applications, being able to analyze materials accurately is essential. Timegate Instruments has developed a novel technique for Raman spectroscopy that makes precise analysis possible and effective. Download the brochure for more details on PicoRaman instrument and its applications. "My research has been heavily focused on various forms of Raman spectroscopy and imaging for diverse pharmaceutical applications. A problem with many of the samples has been photoluminescence, including fluorescence, compromising or completely masking the Raman signal. We have recently been using the time-gated Raman instrument from Timegate Instruments and have found it excellent for these problematic samples."